MoboPlay ransomware uses sophisticated techniques to infiltrate computers and hide from its victims. Use Reimage to determine whether your system is infected and prevent the loss of your files. How do tech support scam viruses infect computers? How to remove MoboPlay lock screen virus and get back the access to your computer? 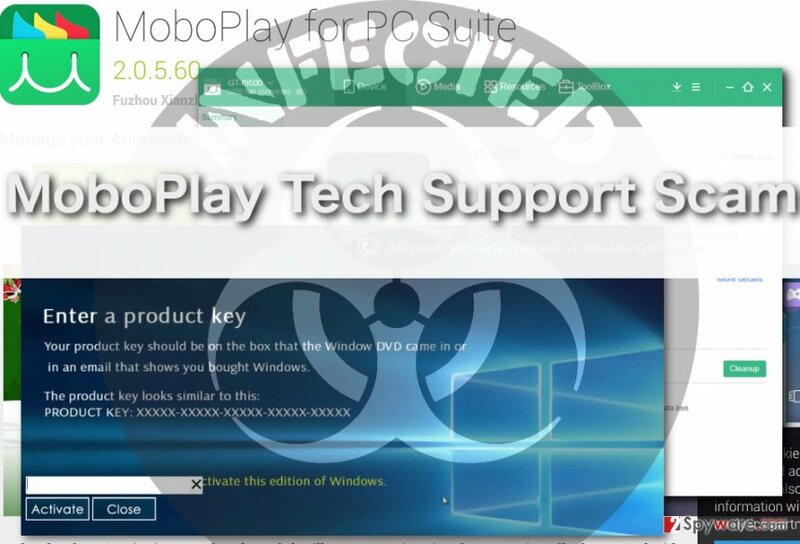 Tech Support Scams are one of this year’s fastest growing cyber threats and MoboPlay virus is one of the newest addition to this virus family . Thus, we think it would be useful to discuss this particular virus in more detail and raise awareness about such viruses among the Internet community. The initial thing we should point out is that technical support scams do not travel as individual viruses but are rather brought by other potentially unwanted programs . We elaborate more on the virus distribution and infiltration issues later in the article. As for now, you may continue reading this article and find out about the working principles of this virus or skip straight to the last paragraph to find out about MoboPlay removal options. If you have tried manual elimination already and it did not bring any good results, you should not hesitate to employ professional malware removal utilities such as Reimage and remove the virus from your computer automatically. Microsoft has detected some suspicious activity on this computer. All access to this device has been revoked due to a network security breach. Attackers might attempt to steal personal information, banking details, emails, passwords and other files on this system. To make the message more believable, the scammers display it in a lock screen  which actually obstructs the user from accessing the data on their computers, creating an impression of a blocked device. From an empty box and the “Activate Now” button we can presume that the users are required a Windows License key in order to get back the access to their account. Nevertheless, none of the legitimate keys will work and another alert urging to purchase a new key will pop up. The trick here is that your Windows license key is not actually expired and the scammers simply want you to pay for a fake product. Since no computer files can be accessed while this lock screen is active, this virus surely deserves a name of a ransomware-like infection . Luckily, unlike with most of the actual ransomware, you can remove MoboPlay and access your personal files again. To do that, look at the recommendations below. As we have already stated previously, tech support scams travel as potentially unwanted programs and use various techniques to infect computers. Perhaps one of the most widespread ways the infiltration is achieved is with the use of deceptive software bundling. For instance, the hackers may take a random application, for instance, MoboPlay, and bind it together with potentially unwanted program such as our discussed tech support virus. While the users think they are installing a regular application management program, the virus can easily slither inside the system and start its malicious activity on it. Advanced software installation is one way to prevent undesirable programs from entering your computer. Just pick “Custom” or “Advanced” installation modes when setting up new software on your computer and pick out potentially unwanted applications manually. MoboPlay virus is an infection that is not that easy to remove. The infected computer users might need to go through several steps of elimination, first having to go past the lock screen and only then moving on to MoboPlay removal. Luckily, below this article, you will find quick instructions which should help you terminate the lock screen. After you overcome this obstacle, you should then remove MoboPlay from your computer using specialized malware removal tools. To remove the lock screen enter 8716098676542789 key in the box next to the “Activate Now” button. Once the lock screen is gone, proceed to the MoboPlay removal immediately. Log in to your infected account and start the browser. Download Reimage or other legitimate anti-spyware program. Update it before a full system scan and remove malicious files that belong to your ransomware and complete MoboPlay removal. If you cannot remove MoboPlay using the key given in the Method 1, you may also try to access Windows Task Manager and terminate the lock screen process there. You will recognize the malicious process from a high CPU utilization and unusual process name. When a new window shows up, click Next and select your restore point that is prior the infiltration of MoboPlay. After doing that, click Next. Once you restore your system to a previous date, download and scan your computer with Reimage and make sure that MoboPlay removal is performed successfully. Guide which is presented above is supposed to help you remove MoboPlay from your computer. To recover your encrypted files, we recommend using a detailed guide prepared by 2-spyware.com security experts. ^ Technical support scams on the rise: don’t become prey for a fraudster!. Virusactivity.com news blog. ^ Report: the anatomy of tech support scams. Malwarebytes lab blog. ^ Avoiding technical support scams. Microsoft.com support page. ^ Ms. Smith. Ransomware-like tech support scam locks screen, labels Windows product key as invalid. Networkworld from IDG. ^ David Bisson. New tech support scams mimic ransomware, lock users' computers. Grahamcluley.com site. This entry was posted on 2017-01-13 at 01:47 and is filed under Malware, Viruses. You can quickly scan the QR code with your mobile device and have MoboPlay virus manual removal instructions right in your pocket. How did you remove MoboPlay virus?